now, it’s on to the next sock! 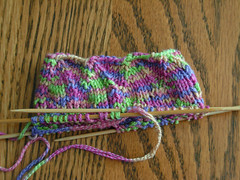 i think (but this could change at any moment… ;)) they’re going to be falling leaves from knitty. hmm…summer of socks, falling leaves…not quite the right combo! maybe i should rethink this! well i haven’t cast on yet, so i guess i still have time to decide. as long as i have fun…. my first sock – ever – is finished! on the downside, i think i should really have gone down a needle size, but i didn’t have any us size 0 handy. on the upside: it was fun and i didn’t have any difficulty…beyond my usual habit of dropping stitches. arrived today. one skein of fearless fibers superwash merino sockyarn in the ‘smoke’ colorway. 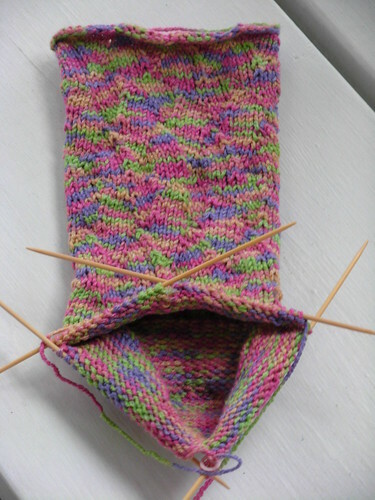 i already have a pattern picked out, so….finishing that second sock may prove difficult. i’ll have to cast on quickly here, or i may have no hope!